Novasyte, the outsourcing commercial services experts in the med-tech space, is pleased to announce their ranking as one of the 2016 Fastest Growing Private Companies by the San Diego Business Journal. Novasyte team accepts award at the Fastest Growing Private Companies recognition ceremony. 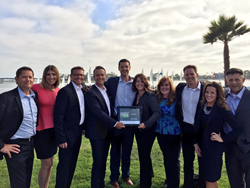 Novasyte, the outsourcing commercial services experts in the med-tech space – driven by people and technology – is excited to announce that it has been ranked 78th on the 2016 San Diego Business Journal’s list of Fastest Growing Private Companies. Novasyte experienced a 71% revenue increase between 2013 and 2015. Moving up significantly from the previous year, 2016 marks the 2nd consecutive year the company has been recognized on the list which reflects its continued growth in the med-tech space. The list represents the region’s most successful and rapidly expanding organizations. Companies on the list are ranked by revenue growth from 2013 to 2015. To qualify, companies must be privately held, headquartered in San Diego, CA, founded before 2013, and meet a minimum gross revenue in 2013. Novasyte partners with med-tech companies, offering outsourced commercial service teams for clinical, sales, technical and recall support. Our flexible model enables us to deploy and manage teams that expand and contract to meet our clients' customer-facing needs. Program success is tracked and measured with our real-time business intelligence analytics that provide our clients with critical insights into their most important resources - their people and their customers.